Migo (Channing Tatum) is a friendly Yeti whose world gets turned upside down when he discovers something that he didn't know existed - a human. He soon faces banishment from his snowy home when the rest of the villagers refuse to believe his fantastic tale. Hoping to prove them wrong, Migo embarks on an epic journey to find the mysterious creature that can put him back in good graces with his simple community and finds Percy (James Corden) a nature reporter (in the mould of Steve Irwin) whose ratings are on a downward spiral and sees the potential hit rate that Migo could get him. Family films area tricky business, children can easily lose interest if there is not story to grab them, no characters to grow affection for and non-fat gags to make the giggle. Thankfully Smallfoot has all of this and some tunes too. The family preview I attended had laughter in spades as everyone present found lots of little gags to appreciate and some physical slapstick to keep the humour rate at a childish enough level to even make this old grump chuckle on more than occasion. 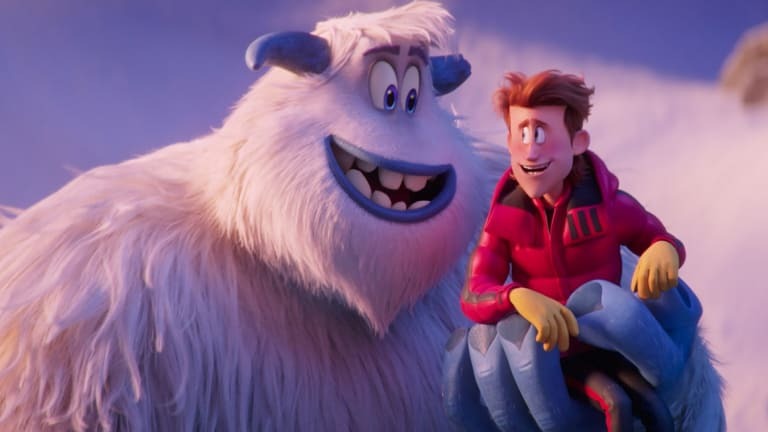 Smallfoot attempts sing along moments to try and keep the audience engaged, particularly when plot points become a little too uninteresting for normal dialogue in an attempt to get our toes tapping, but sadly none of these quite hit the mark. Certainly not in comparison to other family favourites such as Trolls where those tunes still occasionally worm their way back into our internal jukeboxes. The purpose of Smallfoot is to preach the benefits of reaching out those not like its. Those we have been told are monsters because they are different, because we have misunderstood them, because they don’t look or act like we do. A great message for young and old but there were points when this was being hammered home rather than suggested which can often be more effective. There are also lessons in how societies are created, laws applied or perhaps more accurately even the use of religion to provide a truth that constrains rather than frees those within the sphere of influence. For Migo when the story he has been told for so longer no longer lines up with his experience he experiences what many refer to (and have experienced) as deconstruction which sends him on a journey to a deeper, more resonating truth and not just out of his own selfishness but because he wants everyone he knows to experience the truth as he has so that their world is changed for the better. That’s right parents I’m claiming Smallfoot to be one of the best animated family examples of the deconstructive experience! For a film set in such cold surroundings there is a lot of warmth and a lot of heart in Smallfoot, there is plenty to enjoy and there is definitely the potential for conversations to be had on car journeys home from the cinema around its themes. The true test is yet to come however, will its intended audience want to revisit and sadly I have my doubts. Smallfoot is released in cinemas on 12 October .